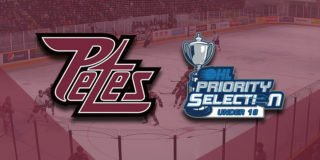 This year’s Family Day home matinee had the Petes battle the Niagara IceDogs in a game which saw several firsts for the Electric City Kids, including Cameron Supryka playing the first home game of his Petes career while newly signed rookie Jake Partridge took to the Memorial Centre ice for his first game in the OHL after being signed by the Petes just hours earlier. 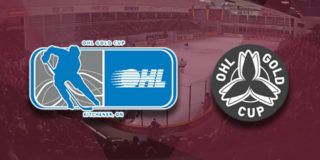 Both Partridge and Supryka would be able to celebrate participating in their first home victories as Peterborough defeated Niagara 4-3 in overtime. Once again this season the Petes partnered with 5 Counties Children’s Centre for the family day game to help raise money and awareness for the local treatment centre. The opening period began with the first Peterborough powerplay of the afternoon as Niagara’s Philip Tomasino headed to the box on a high sticking call within the first 30 seconds. After a swift back and forth where neither team seemed to make it anywhere near the nets, the next penalty fell to the Petes as Pavel Gogolev served 2 minutes for the Maroon and White for having too many bodies on the ice. 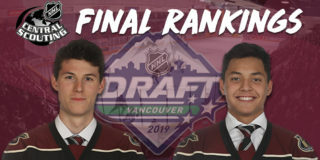 The period remained scoreless as Semyon Der-Arguchintsev of the Petes took the second home team penalty in the opening 20 minutes for hooking and the clock entered single digits as 10 minutes was killed off. Niagara lost their second man as well only moments later as William Lochead took a time out for holding. With 6 minutes remaining the IceDogs took the early lead with their first goal by Akil Thomas from Kirill Maksimov to mark the scoreboard 1-0. Only moments later the Petes retaliated and overwhelmed an unprepared Colton Incze with a Brady Hinz and Austin Osmanski game-tying rocket to make it 1-1. The period died down on little more than a third Petes powerplay as Lochead was again called, this time for tripping against Chad Denault. The buzzer would sound on a 1-1 tie with the home team holding a 12-9 shot count against the Dogs. Lots of chances for both sides, and we’re knotted at 1s as a result! Period 2 would commence with more back and forth and the first punishment of the frame would be dished to Niagara’s goal scorer Thomas for slashing. 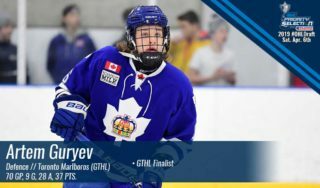 With the powerplay opportunity provided by Thomas’ absence Nikita Korostelev and SDA would send the puck to Zach Gallant down the ice to bring the score to 2-1 in favour of Peterborough. Shortly after he brought the Electric City the lead Gallant would fire another lucky puck received from Korostelev yet again, and Hinz, this time past Incze for a 3-1 Petes lead at the end of 10 minutes. Maksimov would come off a 2 minute Slashing detention for the Icedogs just as Osmanski was taken off the board for the Petes for delaying the game. Former IceDog Chris Paquette would go on a breakaway in the last minute as Niagara put the Petes on another powerplay with the loss of Drew Hunter for tripping. Even though the Dogs were shorthanded, the Petes lost Korostelev to the same call only moments later, which dropped the teams to an equal 4 on 4 and would allow Sam Miletic (with the help of Maksimov) to bring the visitors within one. 40 minutes would close on a slim 3-2 Peterborough lead as the Petes held on to the shot clock 22-14. We’ve got the lead after 40 minutes at the PMC! The third would begin the same as the prior two, with a show of speed and physicality coming from both squads. After an applause-worthy diving stop by Alex Black to keep an IceDogs attacker away from Dylan Wells’ crease , he Petes would lose Declan Chisholm after he was spotted for a check from behind, but Niagara would take a call as well as they sent Johnny Corneil for tripping. The IceDogs would take several strong slapshots on Wells before Osmanski would be called for tripping, taking a Pete off the ice and opening up a possible advantage (ultimately to no avail). Niagara would shuffle the puck around for several minutes before they noticed a slip-up in Wells and were able to exploit a weakness, the play was reviewed and Thomas, Corneil, and Adrian Carbonara were awarded the goal and apples, respectively, to tie the game with 3 minutes remaining in what would have been the final frame. 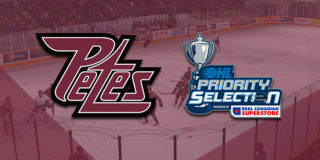 The Petes are back against the Kingston Frontenacs on Thursday, February 22 at 7:05pm. Tickets are available starting at $8 through the Collins Barrow PMC Box Office, online or, by phone at (705) 743-3561.